I received some new fabrics in the mail today! These are all from Sew Fresh Fabrics on Etsy. I already have some of the Metro Living Circles in other colors...I just love them, a great basic to have in your stash. 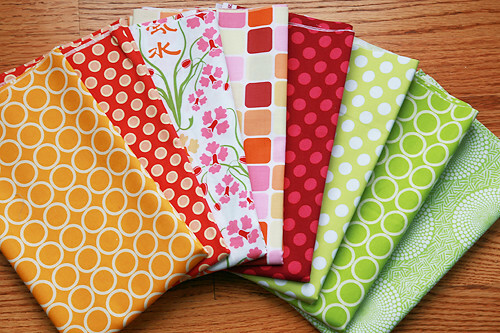 From left to right, Metro Living Circles in Marigold, Doll Baby Dots in Pink, Sanctuary Orchid Feng Shui in Sherbert, Sanctuary Glass Tiles in Sherbert, Ta Dots in Fuchsia, Ta Dots in Lime, Metro Living Circles in Chartreuse and Dan Bennett's Eggs in Lime.